cGMP effects mediated by PKG activation. cGMP can activate Ca2+ influx, by a process involving PKG regulation of ion channels. It can also activate Ca2+ release from ryanodine-sensitive intracellular stores by a pathway involving PKG and cyclic ADP-ribose. The physiological effects of natriuretic peptides are elicited through three classes of cGMP binding proteins: cGMP-dependent protein kinases, cGMP-regulated phosphodiesterases, and cyclic nucleotide-gated ion channels. Members of the natriuretic peptide family, atrial natriuretic peptide (ANP), brain natriuretic peptide, and C type natriuretic peptide, serve as physiological regulators of homeostasis including control of fluid retention and blood pressure. Clinical treatment of various cardiovascular pathologies shows that natriuretic peptides exert beneficial effects in arterial hypertension, myocardial infarction , coronary artery disease, and chronic heart failure. Collectively, these results suggest that ANP is cardioprotective. Antiapoptotic effects of natriuretic peptide are mediated via activation of particulate guanylyl cyclases (pGCs) that modify GTP to elevate intracellular cGMP levels. Increases in cardiac cGMP levels inhibit ischemia/reperfusion damage by activation of the Akt/Bad/Bcl2 signaling pathway that prevents apoptotic cell death. Protective effects of cGMP may involve downstream activation of cGMP-dependent PKG, expressed in cardiomyocytes as the PKG I (but not PKG II) isoform, since PKG activates PI3K/Akt kinase signaling in vascular smooth muscle and endothelial cells. The ANP/cGMP/PKG signaling cascade is well known for antiapoptotic activity in neuronal cell types but is relatively unstudied in cardiomyocytes. However, ANP-induced cGMP signaling could certainly promote antiapoptotic responses in cardiomyocytes via Akt activation, since the protective effects of Akt in the myocardium are well known. ANP exerted opposing effects upon cell survival depending upon concentration that could be related to the intensity of cGMP-dependent signaling activity initiated by ANP. Effects of varying cGMP concentrations upon apoptotic cell death were assessed by TUNEL assay using cultured cardiomyocytes. Treatment with cell-permeant cGMP produced significantly differing effects based upon concentration. cGMP at a low concentration was antiapoptotic, protecting cardiomyocytes from the staurosporine challenge; In contrast, a higher dose of cGMP alone was ineffective. In mature brain cGMP acts mainly in cortex, caudateputamen, cerebellum and hippocampus. In immature brain cGMP is involved in guiding neurons to achieve their destination and it plays important role in myelinogenesis. In mature brain the colocalization of cGMP with glutamatergic and cholinergic system in hippocampus and brain cortex seems to have a functional implication in the view of its role in LTP and LTD. Nitric oxide and cGMP are the main messengers in glutamatergic system. It seems that cGMP is also a very important messenger for cholinergic system, where it could be involved in cross- talk between cholinergic and other neurotransmitters mediated pathways. 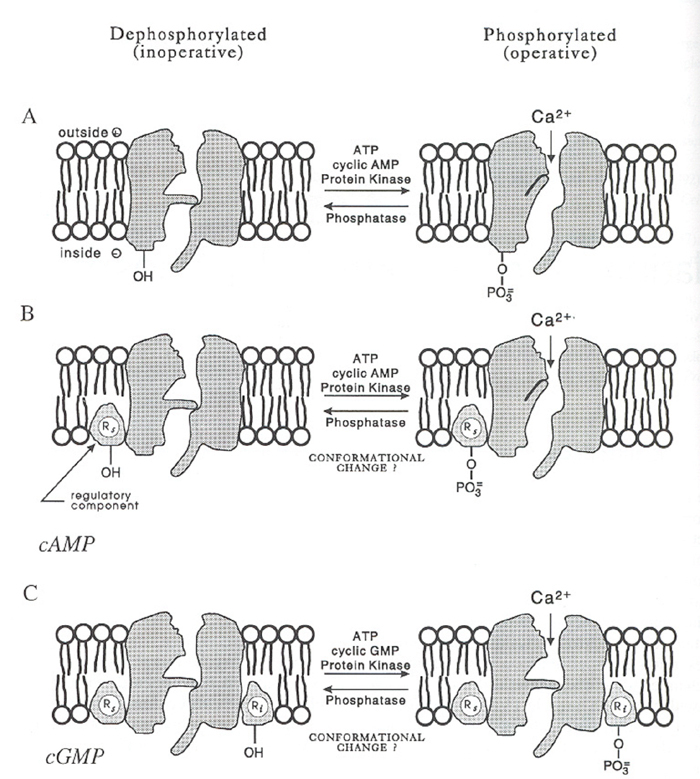 Two major pathways have been reported by which a cGMP increases intracellular Ca2+ concentration [Ca2+]i. cGMP can activate Ca2+ influx, by a process involving PKG regulation of ion channels. It can also activate Ca2+ release from ryanodine-sensitive intracellular stores by a pathway involving PKG and cyclic ADP-ribose. cGMP play a key role in the visual system by regulating the recovery phase of visual excitation and adaptation to background light.